If you don’t teach argument writing, you’re not teaching to the Common Core. Plain and simple. A battery of new standards demand that we teach argument writing and rhetorical analysis to students – and the old genres alone aren’t cutting it. Common Core aside, every teacher should teach argument writing and rhetorical analysis simply because these are crucial life skills with tremendous real-world applicability. Our students will soon become adult citizens who must be discerning when it comes to consuming and creating media. Okay, okay. Let’s dive in! Step One: Make A Strong Sales Pitch. In order to effectively teach argument writing, your students must be engaged in the content and motivated to learn the skills. (This is true of any new concept worth teaching and learning, isn’t it?) Fortunately for us, argumentation is so practical, so pertinent to their own lives, it sells itself. Explain the practicality of argumentation in everyday life. Once they realize that everything is an argument (this article, your lesson plans, that birthday card you sent last month, your water bill, all of it! ), the authenticity is hard to resist. Be engaging. If you’re going to teach argument writing, what better way to kick things off than by showing off your own skills? Craft an argument — visual or written — and show your kids what you’re made of. Step Two: Building A Foundation In Rhetorical Analysis. The term “argument” is often used interchangeably with language referring to rhetoric and rhetorical analysis – with good reason. An effective piece of rhetoric is an effective argument. And the best way to deconstruct a speaker’s argument is – you guessed it – a rhetorical analysis. Once you’ve introduced the notion of argumentation to your students, you must give them a foundation in rhetorical analysis. Here’s why. Writing an argument without understanding the elements of rhetorical analysis is like asking someone to find a buried treasure without a map. It’s impossible to do effectively. Giving your kids a foundation in rhetorical analysis gives your kids the map they need to get where they’re going. As they put those rhetorical analysis skills to work, they’ll be exposed to more and more arguments – and they’ll be thinking critically about how those arguments work. This is indirectly using modeling to teach argument writing to students. The more high quality models they deconstruct, the more good stuff they’ll be able to fold into their own writing. So how are you going to give your kids the foundation in rhetorical analysis that they need to succeed? We’ve found the most success using structured inquiry to teach the concepts students need to know without necessarily focusing on the complex vocabulary used to describe those concepts. A sixth grader will be quick to understand what pathos is, but won’t not be as keen on remembering the Greek terminology. Here’s how we teach rhetoric with structured inquiry. We pick a concept – say Pathos. We don’t tell the kids it’s pathos. We keep that part a secret. Then, we show the students an example – and we ask them, “Is this pathos?” They think, pair, share. We reveal. Then we repeat. And repeat. And repeat. Until students are able to easily identify the concept in the examples they’re shown, and are able to define it in their own words. If you haven’t tried this strategy yet, it’s incredibly powerful and certainly worth the time it takes to set up and implement. If you’d like to get your hands on our structured inquiry materials (something we call “The Rhetomatic” because it practically teaches students the fundamental concepts necessary for rhetorical analysis on autopilot), click here! Step Three: One Triangle To Rule Them All. Armed with this triangle, your students are ready to embark upon rhetorical analyses of all shapes and sizes! Once students have a handle on these concepts and are able to successfully analyze simple texts through a rhetorical lens, increase text complexity while sustaining engagement. The easiest and most effective way to do this? Find modern, complex multimodal texts, or ask your students to find them for you. Examples include complex songs and accompanying music videos, well crafted television advertisements, and celebrity (or political) speeches. We’ve found huge success with this, and have made a habit of posting pop culture analyses to our YouTube channel. We encourage you to take advantage of these videos (see our Taylor Swift example below) as well as the corresponding lesson bundles we’ve put together to help you teach argument writing and rhetorical analysis through pop culture! Step Five: Supercharge Your Curriculum. It’s quite likely that your English curriculum is built on or around some of the most popular works in the literary canon. (Gatsby? Catcher? Death of a Salesman?) With these big shifts toward argument, rhetorical analysis, and informational texts, hordes of English teachers have voiced concerns about losing the classic texts they know and love. Fortunately, this is not a necessary reality. The solution? Teach argument writing and rhetorical analysis through the awesome literature you already teach. We are in the habit of reading literature (like The Great Gatsby) for the purpose of analyzing it through a literary lens (Nick Carraway as unreliable narrator, the importance of setting the novel in West Egg and East Egg, the symbolism associated with the green light, the thematic implications regarding the American Dream) BUT we can just as easily use the rhetorical triangle to engage in a high level rhetorical analysis while simultaneously breathing new life into a classic text! 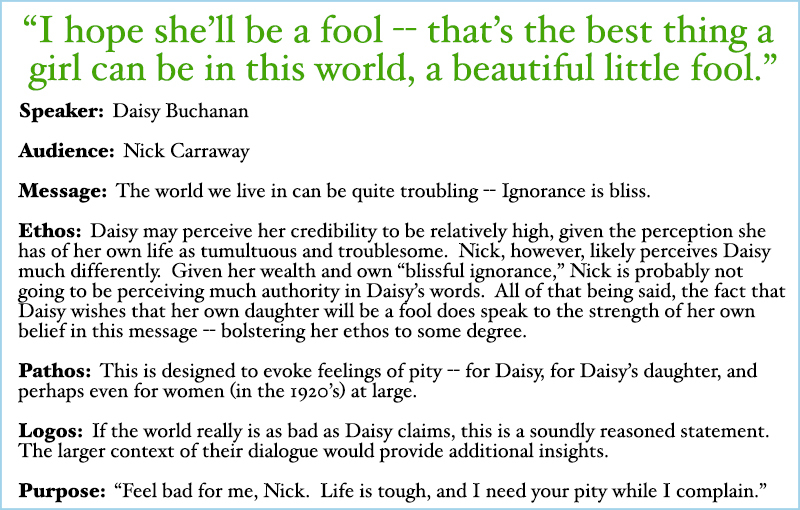 In engaging the text through a rhetorical lens, we gain deeper insight into Daisy’s character while simultaneously learning more about the nuances of argumentation. After all, Daisy does have a motive, and every word she speaks somehow interacts with the overarching purpose she’s trying to achieve. The text becomes even more interesting when students are asked to consider the author as “speaker.” If we revisit the analysis above in this fashion, F. Scott Fitzgerald becomes our speaker, the character of Daisy Buchanan becomes a rhetorical device he constructed to deliver a message about ignorance, his target audience becomes his readership, and his overarching purpose? Something far beyond the scope of this paragraph. In an effort to streamline the process of upgrading your curriculum, we’ve bundled tons of lesson plans together — each grounded in a popular curricular text and designed to teach argument writing and rhetorical analysis. Check our literature based lesson plans here! Step Six: Write, Rewrite, Repeat. First, your students must understand the difference between persuasive writing (which they have been doing since they were toddlers) and argumentative writing (which is far more intellectually straining). 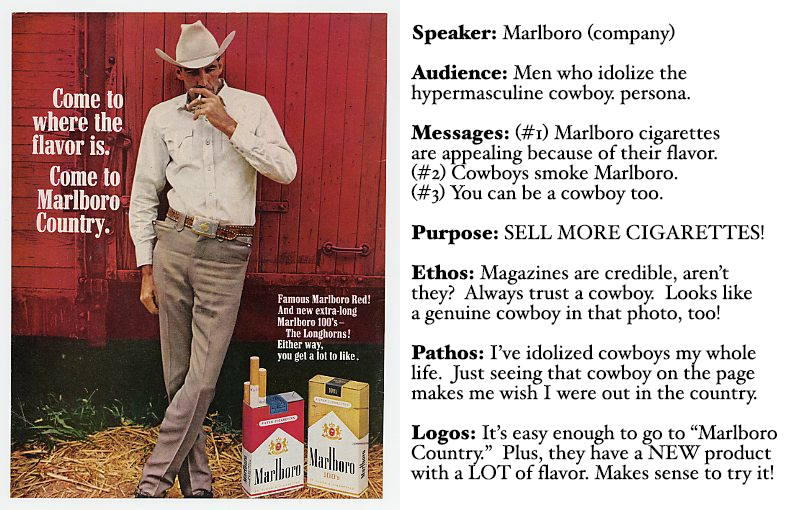 In short, the persuasive seeks to persuade at all costs. It is typically focused on the speaker’s viewpoints, which he or she aggressively supports throughout. Persuasive writing does not require the speaker to consider his or her credibility, does not require evidence, and does not require reasonable thinking. It simply requires persuasiveness. Argumentation, on the other hand, must be evidence based, must consider viewpoints beyond the speaker’s, must seek to establish credibility, must take the audience’s emotional reactions into account… and so on. This can be confusing, because arguments are often highly persuasive… but as a genre of writing, “argument” and “persuasive” function differently. The introductory paragraph should seek to accomplish what just about every other introductory paragraph in the world does — to introduce the main ideas, context, and (in this case) position being argued. Guiding questions to support writing this paragraph: How will you engage your audience? Why is this an issue? Why is it worth my attention? What is the context? Are there any additional circumstances your audience should be aware of? The introduction must end with a thesis statement — although in argument writing, the thesis is often referred to as the “position” or the “claim.” In essence, this is the statement that clarifies the point being argued. #2. Body paragraphs for support. The body paragraphs that follow must seek to support the position at the end of the introduction. That is their sole purpose. They must be filled with reasonable thoughts, grounded in textual evidence (from the reading your writing prompt is paired with or from outside research), and logically strung together. Any and all assumptions are justified. The best arguments are “hard to argue with” for these reasons! The last body paragraph before the conclusion should be focused on “refutation” or “counterargument.” You won’t have to teach argument writing for very long before you realize this is often the most challenging bit for students to wrap their minds around. You’ll save yourself plenty of headaches if your explanation of “refutation” emphasizes the counterargument’s primary purpose: to anticipate and neutralize any opposing claims the audience may be considering. #4. A conclusion that doesn’t make you want to poke your eyes out. Yes, the conclusion should summarize all key points — but it must do something more, too. It must synthesize those points so that they pack a powerful punch in support of the essay’s thesis. This is fertile ground for appealing to the audience’s emotions, to encourage the audience to spring into action or to simply hammer home the paper’s overarching position. 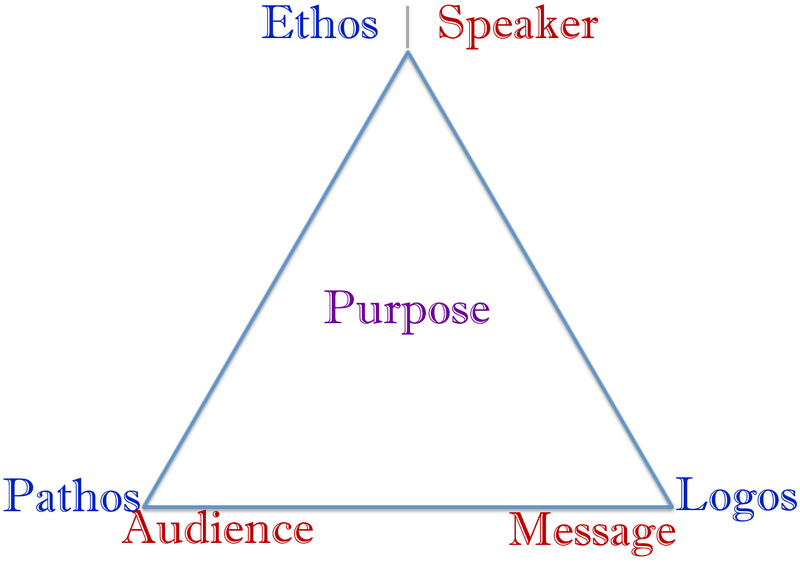 Once students draft their essays, ask them to analyze their own writing using the rhetorical triangle. As students seek to uncover appeals to ethos, pathos, and logos in their own work, and as students retroactively consider how they sought to engage with (and “manipulate”) a specific target audience, their writing will become far more deliberate. These six steps promise to put a powerful foundation in place as you begin to teach argument writing and rhetorical analysis to your students. As with anything worth learning, mastery takes time and hard work, so practice, practice, practice. To lighten your load, sign up below to receive our FREE and AWESOME instructional materials — designed to help you teach argument writing and rhetorical analysis — in your email all year long!